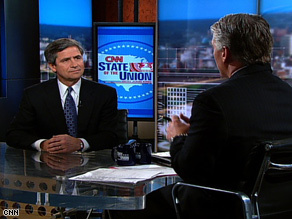 Sestak is weighing a 2010 Senate bid. (CNN) - Pennsylvania Rep. Joe Sestak told CNN Sunday that he wasn't sure Sen. Arlen Specter is really part of the Democratic Party, the latest in a series of tough comments aimed at his potential Senate primary rival. "I'm not sure he's a Democrat yet," he told John King on State of the Union. President Obama said earlier in the week that Specter had his support, with one administration official saying it took the president about "seven seconds" to make that decision. Those remarks don't faze Sestak. Obama likely to pick female nominee? WASHINGTON (CNN) - In the very early stages of the selection process to replace Justice David Souter, Obama administration officials say there is a strong inclination to pick a woman, but stress there is no short list and the field of candidates is wide open. The officials acknowledge the likelihood of a female pick stems in part from the fact that former Justice Sandra Day O'Connor was not replaced by a woman so there is now just one female on the high court, Justice Ruth Bader Ginsburg, out of nine justices. Rachel Brand, a veteran of the former Bush administration's Supreme Court selection process, said the general perception in legal circles is that Obama will nominate a woman for that reason. "Or there is a strong expectation he will nominate a woman partly because Justice O'Connor was not replaced by a woman," said Brand. "That's not to say that he has to or even that he should nominate a woman. It's just what the political imperative seems to be right now." The GOP has declined in part because conservatives have targeted moderates, Sen. Arlen Specter says. 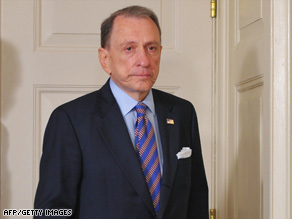 WASHINGTON (CNN) - Veteran Pennsylvania Sen. Arlen Specter said Sunday that he hopes his recent switch to the Democratic Party will serve as a "wake-up call" to an increasingly conservative GOP. He also once again assigned some blame for the recent decline of the Republican Party to the political advocacy group Club for Growth, which targets moderate GOP incumbents who do not adhere to the doctrine of supply-side economics. Club for Growth fought Specter's GOP renomination in 2004 and was set to oppose him again in the 2010 primary. "It would be my hope ... that this would be a wake-up call and the [GOP] would move for a broader big tent like we had under Reagan," Specter said on CBS's "Face the Nation." "The party has changed so much since I was elected in 1980," he said. 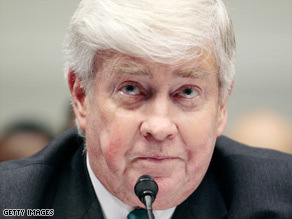 Jack Kemp, a former congressman from New York, was the GOP's vice presidential candidate in 1996. (CNN) - Republican Analyst Bill Bennett told CNN Sunday that with the death of former GOP vice presidential candidate Jack Kemp, "we lost part of our heart today." In 1993, the two men co-founded conservative think tank Empower America. "Well, we lost part of our heart today, John, one of our great voices, one of our lions," he told CNN's John King on State of the Union. "You know, there's a lot of talk, these days, about who will be the next Ronald Reagan. A few of us were thinking, this morning, who will be the next Jack Kemp?" Bennett praised Kemp's efforts to increase the diversity of the GOP and reach out to urban areas and minority voters. WASHINGTON (CNN) - Congresswoman Jane Harman, D-California, told the American Israel Public Affairs Committee conference Sunday she asked Attorney General Eric Holder to disclose all information related to the wiretap controversy involving her, and related to AIPAC. "I want it all out there. I want it in public," she said again. "I want everyone to understand, including me, what has happened." Harman has recently faced scrutiny over reports the government intercepted a conversation she had several years ago, in which she reportedly agreed to seek leniency for Steve Rosen and Keith Weissman, former lobbyists for AIPAC accused of espionage. Prosecutors dropped the case against Rosen and Weissman on Friday. Harman denied contacting anyone in the government about their case. WASHINGTON (CNN) - Leading Democrats and Republicans parted ways on the issue of President Barack Obama's looming Supreme Court pick Sunday, setting the stage for a potentially divisive Senate confirmation fight. Republicans charged that Obama's stated desire to pick someone with "empathy and understanding" masked an intention to pick a judicial activist who would try to pull the high court significantly to the left. Democrats dismissed the GOP charge, arguing that Obama - a former constitutional law professor - would tap a candidate committed to equal justice and not use a high court opening to pursue a partisan political agenda. Obama is currently considering possible replacements for Justice David Souter, who announced his intention Friday to retire at the end the Supreme Court's current term this summer. Souter, 69, is generally considered to be a member of the court's more liberal bloc.